The Frost Hill Financial Services name is originated from the Standardbred horse farm, Frost Hill Farm, located in the small town of Edinburgh, Indiana, just 30 minutes south of Indianapolis. Frost Hill Farm was started by the owners’, Holly Finch, great-grandfather Roy Amos. It all began during World War II, Roy Amos was putting in long hours, seeing to it that the family business, one of the world’s largest hardwood veneers factories, continued to prosper. Until one day, Roy’s physician advised him to slow down and spend time on the family farm, a 500-acre spread. He bought a few horses and decided to delve into the breeding end of harness racing. Roy quickly became known as a strong breeder and harness racing enthusiast. When Roy passed away in 1967, the legacy was carried on by his son, Dale Amos, and then passed on to his granddaughter, Deborah Cook. Frost Hill Farm bred many high–class performers and maintained an active racing stable. 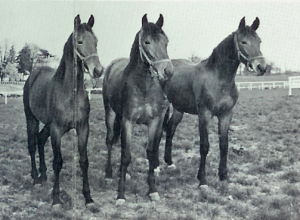 It produced quality horses including the legendary Scott Frost, who won the Hambletonian in 1955, captured the first ever Triple Crown of trotting and went on to become Harness Horse of the Year; the world champion Senator Frost; and the well known Dale Frost and Nora Frost, to name a few. As one of the many grandchildren, I enjoyed my visits around the horse stables. I grew up spending holidays and summer vacations hanging out at the farm. I have many memories of running along the fence lines as the yearlings raced beside me and the late night mad rush to the breeding barn as a mare was about to foal. Sadly things do change, the majestic white main barn stands empty. The solid walnut stalls and brass nameplates are still engraved with the names of Netta Frost and Chipper Frost. The farm is now leased out for soybeans and cattle. But I still treasure the walks beneath the shady trees along the narrow lanes meandering thru pastures and barns where the great Dale Frost and Scott Frost once stood. Frost Hill Financial Services continues with the tradition of high quality service and the standard of excellence that is worthy of it name.